Description: The engineer was no dumby; he parked his engine below the Meacham Blvd overpass to take advantage of the shade. 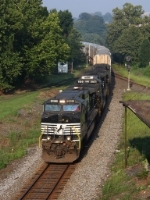 Description: CSX symbol W998 approaches Edgewood Rd. with a CR painted C40-8W. Description: Eastbound on track one with an ex-Con leading. Description: Extra 19G westbound on track one passing CP 88 as he slows for the yard. Description: Two GE's entering lite into Gibson. Description: NS 144 passes the signal at CP-78 on the Marion District bound for Elkhart. Description: NS 144 heads north at CP-78 on the Marion Branch bound for Eklhart. Description: 128 leaves Linwood for Roanoke with a nice HLCX SD60 second out. Description: 212 comes off the bridge at 8:01AM. Description: 20K went by a little after 7, and now it's about 9 as 212 heads east for Croxton. Description: Valley Road, 0854 hours. Past Aeropres, Phiilips Concrete & the bar code reader at MP40 on the NS Lehigh Line.